Cyrus Todiwala OBE DL(Order of British Empire, Deputy lieutenant)is Chef Patron of Cafe Spice Namaste, the landmark Pan-Indian restaurant which he has run for the past 16 years with his wife Pervin. 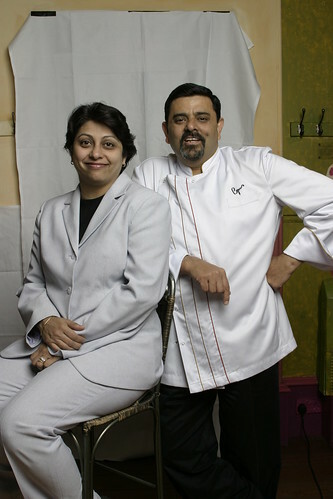 In October 2011, he opened Mr Todiwala’s Kitchen, the signature restaurant at the brand new Hilton London Heathrow Terminal 5. Chef Cyrus is one of the pioneers who took the lead in changing the curry Myth of Indian food in uk.He bought his own style in parsee food, adopted every style of marketing techniques to create a vibe about his restaurant Cafe Spice Namaste. He is a strong believer of basic and strong values, ensured his guest knows that he is behind the stove most times. A contrary to most celebrated chefs of his statute.The knowledge he gained by experience is always shared in developing skills for young people in britain. As far as we know he is one of the most prominent chef in Uk who does charity works to new heights. Our Request to Indian chefs is to get inspired from his hardwork and perseverance he took in developing a respectful image. Chef Cyrus, a Parsee, was born and brought up in Bombay, where his father was the first Indian employee of the Automobile Association and later the Chief of Road Service Western India. He was first inspired to become a chef by his mother’s unforgettable cooking. After graduating in Hotel Administration and Food Technology from Bombay’s Basant Kumar Somani Polytechnic, Cyrus quickly made his mark. From a trainee chef, he rose to become Corporate Executive Chef of the famous Taj Group’s Taj Holiday Village, The Fort Aguada Beach Resort and The Aguada Hermitage in Goa. In 1991, after a stint relaunching a restaurant in Poona, he moved with his family to London, where they have remained ever since. Today, Cyrus is known for his refined, elegantly spiced and sophisticated cooking. A popular monthly ‘Khaadraas Club’ (Greedy Gourmand’s Club) takes place every 5-6 weeks at Café Spice Namaste to bring Parsee cooking to a wider audience. Ever the keen environmentalist (he helped to establish two bird sanctuaries in Goa), Cyrus is a champion of sustainability and Buying British. In 2011, Café Spice Namaste received the Sustainable Food Award from the Corporation of London and Cyrus was named Sustainability Champion by the London Chamber of Commerce and Industry. In the same year he received the Special Award for Commitment to the Environment and Sustainability from the Footprint Forum. He is an advisor on HRH The Prince of Wales’ Mutton Renaissance Movement and on the London Food Board. He has a deep passion for education and training, and is an Honorary Professor of the University of West London (formerly Thames Valley University)’s prestigious London School of Hospitality, Tourism and Leisure. He holds an Honorary Doctorate from London Metropolitan University. Cyrus often devotes time to training fresh talent, and enjoys influencing tomorrow’s chefs. He is a Springboard UK Ambassador and active in the Chefs Adopt A School Programme of the Academy of Culinary Arts. Adventure Gourmet at Café Spice Namaste, a series of master class demonstrations featuring high-profile chefs such as John Williams of the Ritz, Anthony Demetre of Les Deux Salons, Peter Gordon of Providores and Tapas Bar and Paul Gayler of The Lanesborough, was launched four years ago to bring professional and budding chefs closer to their food heroes, part of Cyrus’ commitment to the wider hospitality industry. The erudite Cyrus is also the author of three successful cookbooks – Café Spice Namasté, International Cuisine India and, most recently, Indian Summer. 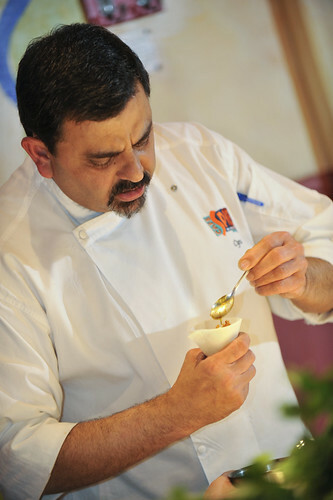 He is the only Indian chef in the UK to have been recorded for the archives of the British Library. No stranger to the media, he appears regularly on BBC1′s Saturday Kitchen, on Daybreak on ITV1, Drop Down Menu on Channel 4 and is often interviewed on radio, including BBC Radio 4’s Food Programme and LBC Radio. He has been featured recently in METRO, ES MAGAZINE (Food Special, autumn 2011), THE INDEPENDENT, CATERER and HOTELKEEPER (December 2011 cover story), EASTERN EYE, and in February 2012, food writer Mark Bittman, writing in the THE NEW YORK TIMES, named Café Spice Namaste his favourite Indian restaurant in London. (http://travel.nytimes.com/2012/02/12/travel/in-london-great-indian-food-without-the-fuss.html?pagewanted=all). In 2011 Cyrus was given his first entry in the Who’s Who. On 29th March 2012, he cooked the very first Diamond Jubilee lunch of the Queen and the Duke of Edinburgh at the start of their Diamond Jubilee tour. It was attended by 400 dignitaries at Walthamstow Town Hall. Assisting him was a brigade of chef peers and catering students from local colleges. On 31st March he prepared his ‘Country Captain’, the main course served to the royals, on BBC1’s Saturday Kitchen. Very interesting and lovely post. Nice little profile of chef Todiwala!